When I was a kid, I started making my Christmas List before Thanksgiving with all of the latest and coolest toys. I always wanted a Chia Pet and didn't get one until I was out of high school. That was the best Christmas ever! Now that I am a Mom, my kids make their lists right around Thanksgiving as well. They too add the hottest toys out to the top of their lists. I always want to top last years Christmas by making sure I have at least one of the hottest toys out for the year. By shopping Kmart and the Fab 15 I can do just that! 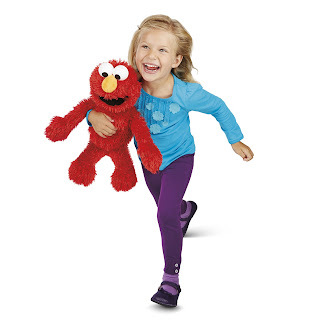 A hot toy that is on Amelia's list includes the Disney Frozen Sing Along Elsa and Play All Day Elmo! My older girls are begging for the VTech Kiddizom Action Camera so they can record the "stunts" the do on their scooters! I am looking forward to seeing their faces when they open their presents this year and see that the top toys are under the tree. 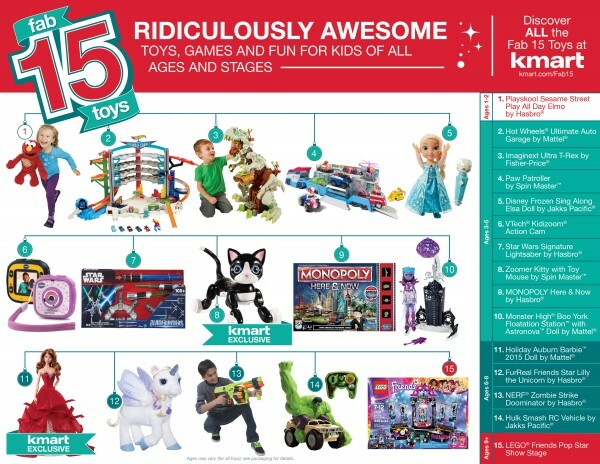 This year, Kmart's Fab 15 Toys include Disney’s Frozen, Star Wars, LEGO®, Barbie™ and NERF,® which have been tested by Kmart’s first-ever Kid Toy Advisory Board – a select group of kids of Kmart employees who are serving as toy experts and holiday toy consultants. To stay on top of the hottest toys make sure you get the 2015 Toy Book and check out the Fab 15!